As way-out putter designs go, the Nike Drone 2.0 isn't too offensive to the eye. The one thing you can say for certain is that it's a huge improvement on the original Nike Drone which looks a kitsch belt buckle attached to the end of a putter shaft. Seriously, the look of the putter is obviously designed to help you align the face of the putter to your intended target line and that's why the super-long aimline is such a great feature. In fact this is one of the longest aimlines on any putter we've ever tested at Best-Putter.com. Whether the conflicting angled lines surrounding the aimline appeal or not is likely to be a personal preference. I can't say that they helped me a lot, or particularly appealed to my eye, but you may be different. The great element of the feel of this putter is undoubtedly its stability through impact. 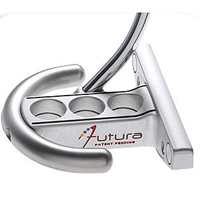 This is the benefit you get for the unorthodox appearance of this and all futuristic putters. The large head size allows the weight of the putter head to be located in the most effective places to produce a high "moment of inertia" (known as MOI). This means that the face resists twisting on off-center strikes and feels like it's moving on its own pre-set swing path. Both are good news if you are a mid-high handicap player who misses the center of the putter every now and then. The Drone 2.0 does feel quite a bit harder than the Nike Method 00 range, however, so if you're after a soft feel for very fast greens, one of these would be a better choice from the Nike range. The roll from the Nike Drone 2.0 is good - no complains here! If the looks don't put you off this putter, then you'll find the hugely long aimline, feel and roll attractive characteristics.